As promised in my birthday post here is the recipe for the pastries I made on my birthday. First I made the Pâte brisée (short pastry) since this is the hardest part of this recipe. Preheat your oven to 160 degrees and put 12 butter-filled molds or a greased muffin tin on a baking tray. Start by sieving 100 gr. Flower and 50 gr. Sugar over a large bowl and add salt and chopped (cold!) butter to it. With a fork mix the flour, sugar and butter, sprinkle the cream butter through the flour mixture. Knead the dough with your hands until it starts to stick well and you can form a beautiful ball. Wrap the ball dough into household foil and leave it in the fridge for half an hour. Make the Pastry Cream recipe in the meanwhile. Remove the stewed dough from the fridge, sprinkle your worktop with flour and slap the dough flat into a slice. Roll out with a rolling pin (sprinkle a little flour on the dough) until a slice of a few millimetres thick, cast a round with the stitch shape and put it in a mold. Press a little on the bottom and wipe the edges off. Repeat this until you have filled all the molds. Pour with a fork or knife small holes in the bottom of the dough and put it in the preheated oven for about 20 minutes. Once the dough is beautifully golden brown the pastries are ready and you can take it out of the molds carefully. Let the cakes cool on a sheet of baking paper. While the dough sits in the fridge for half an hour you can start making the Pastry cream. This amount is for half a litre. You will have a bit left over or you can stuff your pastries like I did. Mix the egg yolks with the flour and a spoon of milk in a bowl to create a smooth mass. In the meantime, cut the vanilla pod open and remove the marrow with a knife. Heat the milk with the sugar and the marrow of the vanilla until the sugar dissolves. Pour hot milk, bit by bit in the bowl with egg yolks mixture. Keep stirring, otherwise the egg yolks can stole. Pour the mixture back into the pan and cook to a boil. Cook for about 5 minutes until it reaches the desired thickness. Let the Pastry Cream cool down, while still stirring. When the Pastry cream has cooled down you can start with the topping of the Pâte brisée. 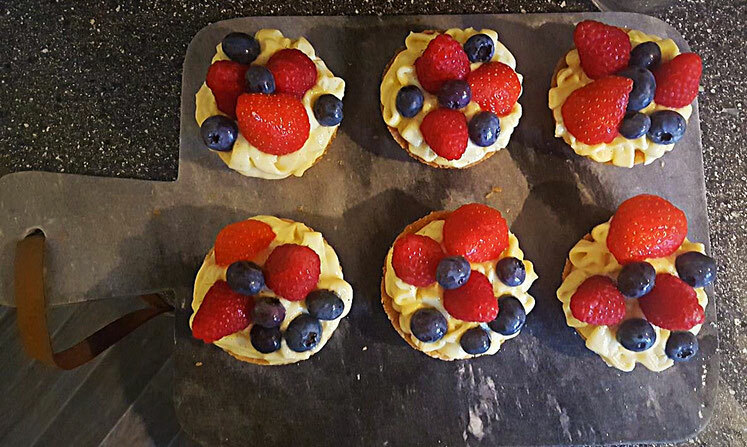 For topping of the pastries I used raspberries, strawberries and blueberries. But of course you can pick your favourite fruits to top off the pastries. Fill the Pâte brisée with the pastry cream. Sprinkle the powdered sugar over the pastries. Did you try this recipe? What do you think about it? Leave a comment below.